This post contains affiliate links, see the end of the post for full disclosure. Powered by first-of-its-kind Vacuum Blending Technology, the Optimum Vac 2 Air Vacuum Blender is a groundbreaking appliance designed to improve food quality, preservation and shelf life. Vacuum technology eliminates the oxidation process by drawing the air (oxygen), which can lead to the destruction of nutrients in food, out of the blending jug so you can enjoy maximum benefits. The vacuum technology allows you to blend ahead of time and enjoy the same benefits and great taste as you would from a freshly blended smoothie. 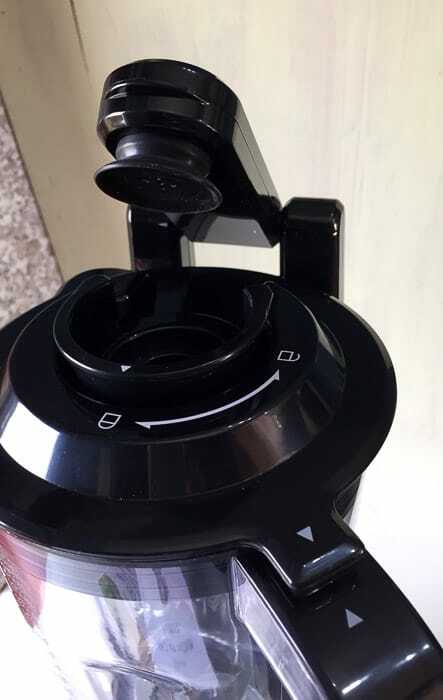 The photo above shows how simple it is to put the vacuum in place, once your ingredients are in the jug, you have to make sure you have the arrows lined up and the inner lid in the locked position, then you put in drop the vacuum outlet on top of the small lid, plug in the blender and switch on. The vacuum function is specifically designed for use with the Smoothie and the Vegs & Fruits preset function. 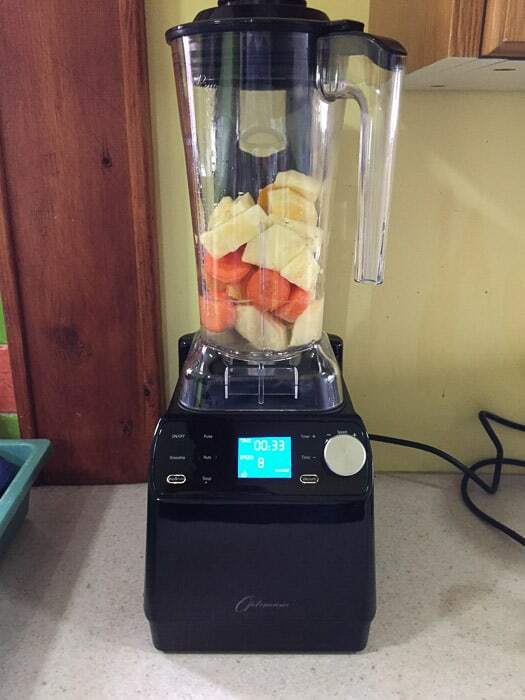 You press the Vacuum button followed by the Smoothie or Vegs & Fruits preset function, then press the On/Off button. The blender activates for 70 seconds (NASA style countdown!) then the preset is activated. The blender stops when the operation is complete. To release the vacuum press the rubber seal on the top of the vacuum outlet and lift it up. Then press on the rubber seal on the inner lid and you will hear the air release. I don’t have a juicer so one of the things that really excited me about the Optimum Vac 2 Air Vacuum Blender was how easy it would be to make juices in a blender that didn’t separate and oxidise after a few hours. I decided to test out the Vac 2 by making a Pineapple, Carrot and Orange Juice using the Vacuum technology function. 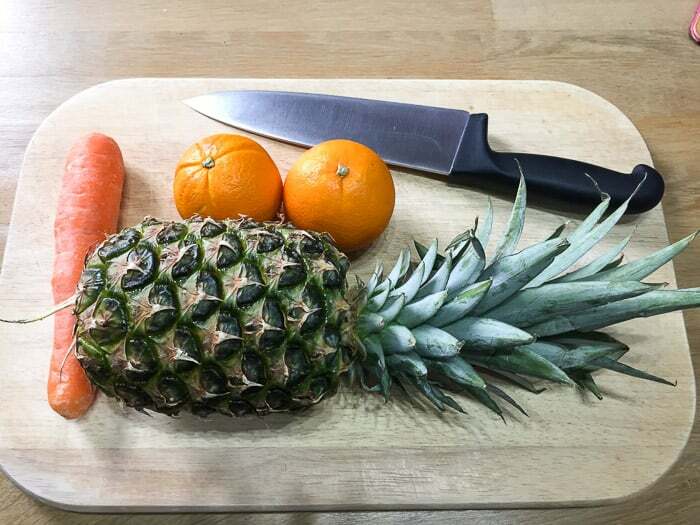 The juice ingredients only need to be peeled and roughly chopped, the Vac 2 does the rest. By blending in a Vacuum environment, the nutrients are fully preserved and freshness is retained until you open the lid. Exposure to oxygen, or oxidation, compromises the quality, texture and taste of the resulting smoothie. In a Vacuum, the smoothie is finer, smoother, and protected from separation and discolouration. By preventing the oxidation process, nutrients in fresh ingredients are fully preserved to ensure you receive the maximum benefits from every smoothie. Watch this video to see how the Optimum Vac 2 Air Vacuum Blender performs against the Vitamix 5200. 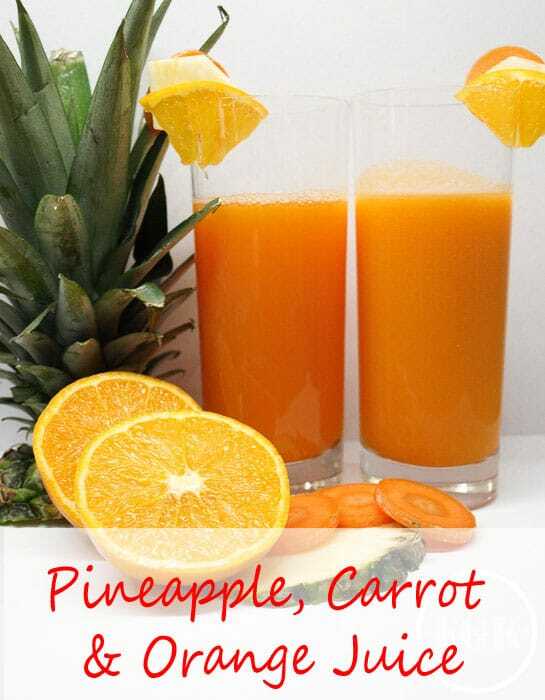 A fresh and fruity juice drink made with pineapple, carrot and oranges, blended in the Optimum Vac 2 Air Vacuum Blender. Cut the skin from the pineapple and remove the core, using one half only, chop into rough chunks. 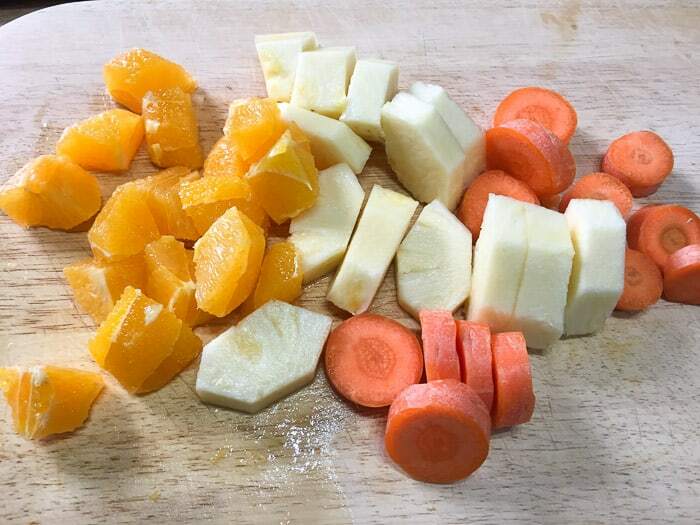 Wash the carrot, top and tail, then cut into rough chunks. Remove the skin and pith and pips from the oranges and cut into rough chunks. Place all the ingredients into the jug of the Optimum Vac 2 Air Vacuum Blender. Close the lid making sure the arrows match. Check that the inner lid is locked. Press the vacuum button followed by the Vegs & Fruits preset function, then press the On/off button. 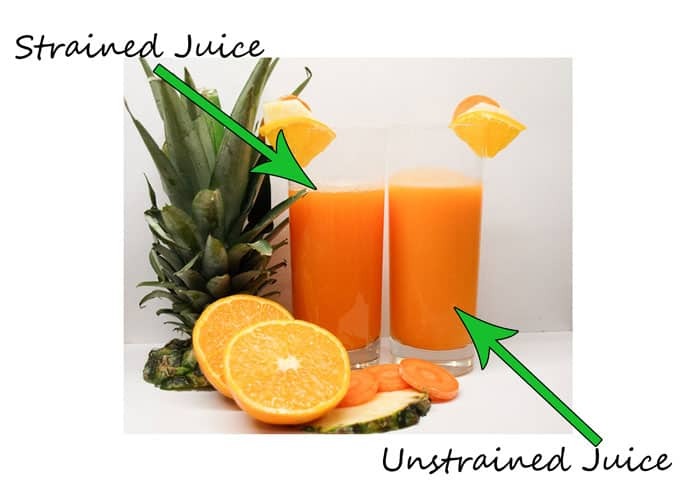 You can either drink the juice in it's 'smoothie' form i.e. quite thick, or strain it through muslin and enjoy it as a thinner juice. 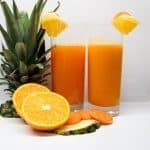 You can see the subtle difference in the strained and unstrained juices, the pulp makes the unstrained juice a lighter colour as well as thicker. I have to say though they were both really delicious. The Vac 2 is easy to use with presets and a dial and timer function to give you maximum control. The jug is huge (2 litres) so you can blend large quantities of soup, sauces and smoothies. You can make your smoothies or juices ahead and they won’t oxidise or separate. The Vac 2 is an incredibly powerful blender and can easily pulverise hard fruits, vegetables and nuts. Wet and dry multi-purpose 6-blade stainless steel assembly. It’s noisy, but all power blenders are noisy. I actually thought the Vac 2 was slightly less noisy than the G2.3 and it seemed to start more smoothly. It’s tall, product dimensions are 200x235x515mm. 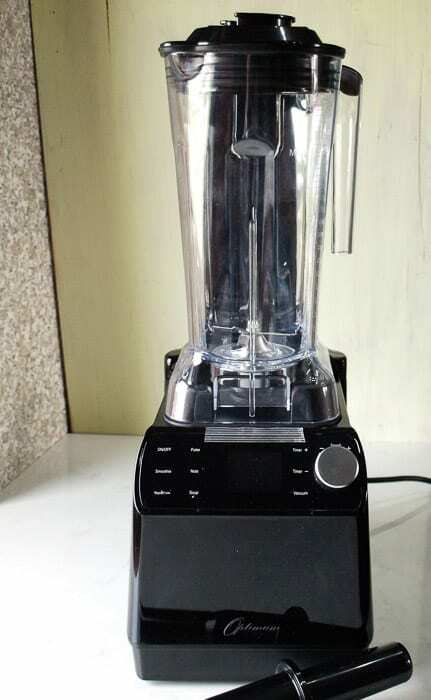 The vacuum function means that the blender has some additional height. I used to store my G2.3 jug beside the base unit under my wall cupboards. This isn’t possible with the Vac 2, so check that you can find a space to accommodate it where there isn’t anything above it. I am super-impressed by the Optimum Vac 2 Air Vacuum Blender. I thought my G2.3 couldn’t be bettered but I was wrong, and I look forward to sharing more recipes made in the Vac 2 very soon. If you’d like to order an Optimum Vac2 Air Vacuum Blender, at time of writing it’s on offer at £399. Order it or any other Froothie appliance through either of these links and you will receive free P&P. Just add “3116 free ambassador delivery” to the comment box when ordering. If you order by phone, just mention the code. The delivery charge will be credited back to your card. Froothie offers a five-year warranty, which can be extended to ten years for an extra fee. There’s also a 30-day money back guarantee with free return postage costs. 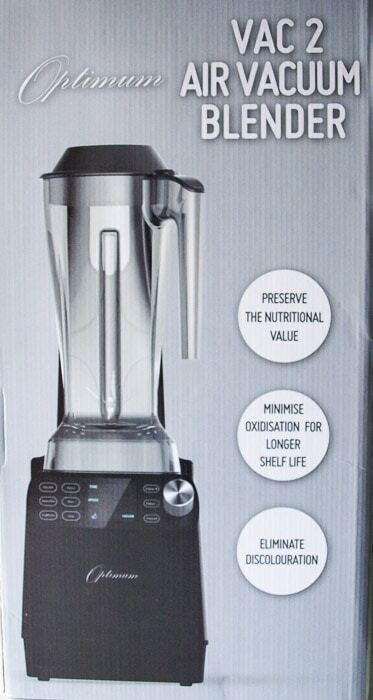 Disclosure: Froothie UK sent me the Optimum Vac 2 Air Vacuum Blender to use and review at home. I have not been paid for this post and was not required to give the blender a positive write up. All opinions are my own. Affiliate links included in this post. That top photo is just gorgeous Janice. I’m craving this smoothie now, it looks deeeeeelicious. I’m super impressed with the Vac2 too. I’m just about to have a smoothie I made 2 days ago and it looks just as good as when I made it. Yes, I really couldn’t believe how good it is. Two days without separation is really good.